State and local excise tax collections on retail cannabis sales surpassed $1 billion for the first time in 2018. This marks a 57 percent increase over 2017 levels, driven partly by the start of legal retail sales in California and partly by rapid growth in cannabis tax revenues in five other states reporting revenue data: Alaska, Colorado, Nevada, Oregon, and Washington State. General sales taxes on cannabis are also raising substantial revenues. In 2018, general sales taxes on cannabis generated a combined total of more than $300 million in California, Colorado, Nevada, and Washington. Alaska and Oregon do not levy statewide general sales taxes and Massachusetts is not yet reporting data. While cannabis tax revenues are meaningful, and growing rapidly, they still represent less than 1 percent of total state and local tax collections in each of the six states reporting data. Cannabis taxes are a potentially important source of revenue for states and localities, but they will not be a transformative one. The price of cannabis is falling, and this will pose a major challenge to cannabis tax revenue collections in many states. In Colorado, for instance, average wholesale cannabis prices are down 61 percent from their 2015 peak. Most states with legal sales underway base their tax systems on the price of cannabis, meaning that price cuts leave these states vulnerable to reductions in revenue. So far, the amount of cannabis being sold on the legal market has grown quickly enough to prevent a price-induced revenue decline. But when consumption begins to stabilize, states that have linked their tax systems to the falling price of cannabis will likely be disappointed by the revenue yield of those taxes. Nationwide legalization and taxation of recreational cannabis could generate approximately $11.9 billion in state and local excise and sales tax revenue each year. This assumes taxation levels similar to those that currently exist in Washington State. Revenue estimates for all 50 states are provided in Appendix B of this report. States should apply their cannabis excise taxes based wholly, or partly, on the weight of the cannabis being sold. Taxing the product based exclusively on its price poses a major challenge to the long-run sustainability of state and local cannabis tax revenues because prices have been shown to fall dramatically following legalization. In the long-run, states are likely to see faster revenue growth, and less volatility, from a tax based on weight rather than price. Weight-based tax rates applied to cannabis should be indexed to grow alongside the rate of inflation each year. This will prevent erosion in the real value of these taxes over time. States should phase-in their cannabis taxes over time, rather than locking in a permanently low rate of tax. Low tax rates can help legal businesses price cannabis at levels more competitive with the illicit market during the early stages of legalization when legal prices tend to be highest. But as prices fall and consumers become accustomed to shopping in the legal market, low tax rates will no longer be needed to discourage shopping in the illicit market. Earmarking cannabis revenues to specific public services should be done sparingly and should be limited to causes with a direct relation to cannabis such as the regulation of the market and the implementation or expansion of substance abuse treatment programs. Arbitrary constraints on how certain revenues must be spent can make it difficult for lawmakers to craft budgets that direct public revenues to the areas where they are needed most. Pot, weed, marijuana, cannabis—the flowering plant that is the subject of this report goes by many names. Recently, government officials in California, Massachusetts, Washington State, Canada, and elsewhere have begun to use the plant’s formal scientific name, Cannabis, when writing laws and naming agencies that regulate the substance. But in popular culture, “marijuana” remains the most familiar term. It is also a term that, at least in the U.S., carries with it a history of racism and xenophobia. The cannabis plant existed in the United States as early as the late 18th century and was widely cultivated for medicinal and industrial purposes. According to journalist and anti-prohibitionist H.L. Mencken, there was no documented use of the Spanish word “marihuana” prior to 1894. Use of the Spanish word by cannabis prohibitionists was intended to link the plant to Mexican immigrants who were falsely blamed with introducing the substance to the U.S. The transition toward using the exotic-sounding word, “marijuana,” was accompanied by the debut of racist and xenophobic arguments in support of prohibition. Modern criminalization of cannabis is still racialized as seen in the racial disparity in cannabis arrests and prosecutions, and wrongly equating immigrants to “drug dealers and rapists,” among other examples. This report uses the more neutral and scientific term, “cannabis,” throughout. State policy toward cannabis is evolving rapidly. States did not begin legalizing cannabis for medical use until the late 1990s, and as recently as 2012, recreational cannabis use was illegal in all 50 states. Now, 33 states and the District of Columbia (D.C.) allow the use of cannabis for medical purposes, adult recreational use, or both. As of January 2019, 10 states and D.C. have legalized recreational cannabis for adult use. Seven of those states (Alaska, California, Colorado, Massachusetts, Nevada, Oregon, and Washington State) have retail businesses that are selling cannabis and collecting state and local taxes and two more states, Maine and Michigan, are in the process of regulating and licensing their legal markets. Shifting public attitudes and current political momentum suggest that more states are likely to pursue cannabis legalization and taxation in the near future. While much of the policy debate around cannabis legalization rightly focuses on potential health and criminal justice impacts, legalization also has revenue implications for state and local governments that choose to tax legal purchases of cannabis. This report examines issues surrounding the design and implementation of taxes on cannabis at the state and local level and takes a close look at the revenue performance of retail cannabis taxes in the states where taxable sales are underway. There are several options to consider when levying a tax on sales of legal cannabis. States can include cannabis in their general sales tax bases, levy a special tax on cannabis and products containing cannabis, or pursue both approaches simultaneously. Expanding state and local sales tax bases to include cannabis should be straightforward in most cases: the general sales tax rate can simply be applied to the total price of the cannabis or cannabis-containing product. But effective cannabis tax policy should go beyond simply adjusting existing sales tax bases to include the product. Special excise taxes can mitigate the negative impact of cannabis use by discouraging its consumption and raising revenue that can be used to offset the potential social costs of legalization and the past social costs of criminalization. In other words, the tax treatment of legal cannabis should be similar to that of tobacco and alcohol, both of which face excise taxes at the federal, state, and sometimes local levels. The following discussion addresses some of the advantages and disadvantages of various forms of excise taxation and concludes that an inflation-indexed, weight-based tax should be a key component of any state cannabis tax regime. Excise taxes are often based on the quantity of the product being sold rather than on its price. For example, cigarettes are currently taxed at $1.01 per pack at the federal level and $1.79 per pack on average at the state level. Alcohol and gasoline are typically taxed per gallon sold. In the context of cannabis, the appropriate measure of quantity is the product’s weight. Model legislation proposed by the Marijuana Policy Project (MPP), for instance, recommends an excise tax on cannabis that varies based on the part of the plant and is adjusted annually for inflation. The rates recommended by MPP are $50 per ounce of cannabis flowers, $15 per ounce of cannabis leaves, and $25 per immature plant. The primary advantage of a weight-based tax is that the amount of revenue raised should be relatively stable even in the face of the significant drop in cannabis prices that has been shown to follow legalization. In Colorado, the average wholesale price of cannabis fell by more than half over the span of just two years (from July 2016 to July 2018). Cannabis prices in Colorado as of January 2019 are down 61 percent from their 2015 peak, as indicated by the data in Figure 1. These dramatic price declines, which are likely to continue in the years ahead, have major implications for the revenue that Colorado can raise though its price-based tax system. A weight-based tax, by contrast, would not be vulnerable to revenue loss every time cannabis sellers reduce their prices. Weight-based taxes also have enforcement advantages, as they tend to be collected earlier in the production process rather than at the final point of sale. An earlier collection point is also helpful in ensuring accurate tax collection on edible products that are only partly comprised of cannabis. A weight-based excise tax applied to chocolates containing cannabis, for instance, should be based on the weight of the cannabis used in making the product—not the cocoa, sugar, and other ingredients that make up the final product. A weight-based tax may also deter tax avoidance schemes in which a retailer sells (or even “gives away”) highly-taxed cannabis at a steep discount on the condition that the customer purchases a lower-taxed product such as a t-shirt or pipe. Weight-based taxes should be applied to all cannabis transferred by licensed businesses, including those that businesses label as gifts with purchase. Additionally, states seeking to apply excise taxes at the wholesale or distributor level may find weight-based taxes to be simpler than price-based taxes, especially in the case of vertically integrated businesses where one business entity, or related entities, is responsible for growing, processing and ultimately selling the product to consumers. Determining the true value of cannabis transferred within a single business entity, or between related entities, can be difficult. Determining its weight, by contrast, is more straightforward. One potential disadvantage of a weight-based tax on cannabis is that it does not account for the potency of the cannabis being cultivated. The potency of cannabis is driven primarily by its tetrahydrocannabinol (THC) content. A weight-based cannabis tax may therefore inadvertently incentivize producers to cultivate stronger cannabis because it would have a somewhat higher sale price, yet still only be subject to the same amount of tax as lower potency cannabis. This concern may be of limited significance, however, as emerging evidence indicates that high-potency cannabis does not sell for a significantly higher price than low-potency versions of the product. Even under a weight-based tax, states and localities do have options to ensure potency is reflected in their tax bases. For instance, Alaska, California, and Maine each tax the plant’s more potent flowers at a higher rate than its less potent leaves. This structure resembles the current approach to taxing alcohol, where categories of product that are of higher potency, such as liquor, are subject to higher per-gallon taxes than categories of lower potency, such as wine and beer. Another disadvantage of weight-based taxes is their vulnerability to inflation, as a flat per-ounce tax rate written into law will inevitably see its real value decline over time. Fortunately, this disadvantage is easily remedied by writing the tax law so that the rate is automatically adjusted each year to keep pace with a broad measure of inflation in the economy. Many states already include such a provision in their motor fuel excise tax laws. 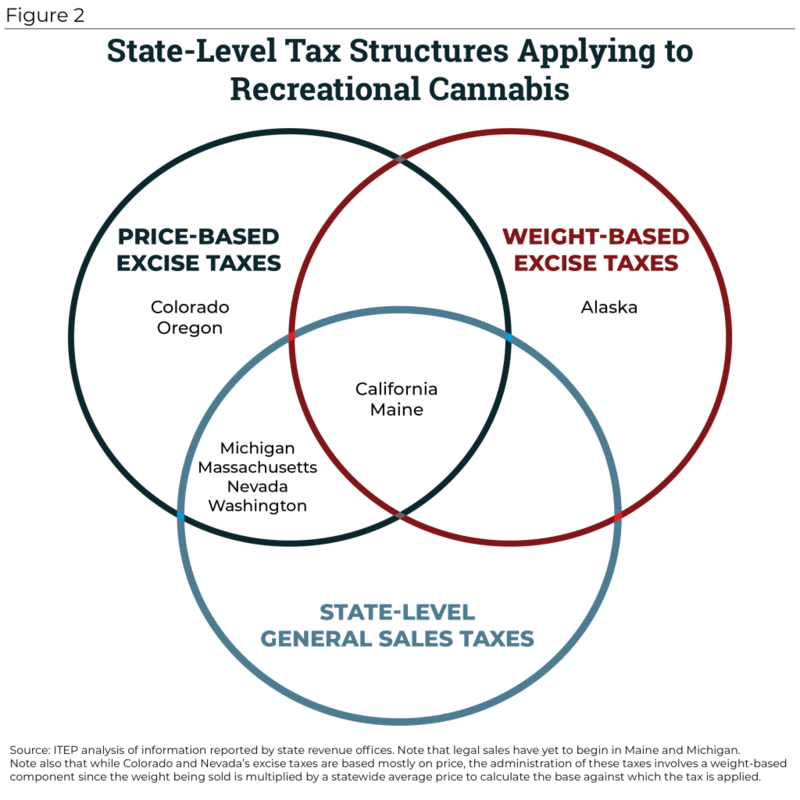 On balance, the stability of weight-based taxes even in the face of rapid price declines provides a compelling reason for every state with legal sales of recreational cannabis to include a weight-based component in their tax regimes—either as a complement or substitute to the price-based taxes described below. Weight-based taxes must be indexed to inflation, however, to avoid long-run revenue declines associated with inflation. The most common alternative to a weight-based excise tax is taxing cannabis based on its price at either the retail or wholesale level. A price-based tax automatically adjusts to the size of the consumption base to which it applies, meaning that it will capture the same percentage of overall spending on cannabis even when the product’s price changes. One potential advantage of a price-based cannabis tax is that it will result in higher tax payments on more expensive cannabis sold under premium labels, which is likely to be purchased by consumers with somewhat more disposable income. Another advantage is that it may result in higher taxes on stronger, more intoxicating cannabis (as mentioned above, however, the link between cannabis potency and prices may be weaker than many observers initially anticipated). A third advantage is that state tax departments may find it easier to administer a tax based on reported sales prices rather than having to establish a system for measuring, reporting, and verifying the weight of cannabis sold. The most significant disadvantage of a price-based cannabis tax is that its yield is likely to be severely restricted by the falling price of cannabis. It is still unclear how much farther the price of retail cannabis might fall, and it is therefore also unclear how much revenue a price-based cannabis tax will yield in the long run. Moreover, price-based taxes can pose a challenge when lawmakers seek to apply them at the wholesale level because determining the true price of cannabis within a vertically integrated firm is often difficult. In Colorado, for instance, cannabis retailers were initially required to cultivate at least 70 percent of the cannabis they sold. This requirement made it very difficult for tax authorities to determine the wholesale price of cannabis since most cannabis in the vertically integrated industry was being “sold” within the same firm. This difficulty forced regulators to adopt a de facto weight-based system wherein cannabis “sold” at the wholesale level was subject to a tax based on a single estimated average price of cannabis, rather than on a “sale” price reported by the firm. Aside from Colorado, Nevada is the only other state with a price-based tax at the wholesale level and it also bases its tax calculation on a single statewide average market price. Marijuana producers, processors, and retailers are prohibited from making sales of any marijuana or marijuana product, if the sale of the marijuana or marijuana product is conditioned upon the buyer’s purchase of any service or nonmarijuana product. This subsection applies whether the buyer purchases such service or nonmarijuana product at the time of sale of the marijuana or marijuana product, or in a separate transaction. The Vermont Governor’s Marijuana Advisory Commission also recently recommended that any legislation establishing a system of legal sales should include similar language. Other types of discounts, such as those offered to employees or to customers buying larger quantities, are also problematic for price-based excise taxation. There is little rationale for collecting lower taxes on cannabis sold to employees than to people who do not work in the cannabis industry, or on cannabis sold to people buying large amounts as opposed to small amounts. For this reason, states considering price-based taxation should consider applying their taxes to the gross price of cannabis before such discounts are applied. Ultimately, the uncertainty surrounding future cannabis pricing makes taxing cannabis based solely on its price a risky proposition. 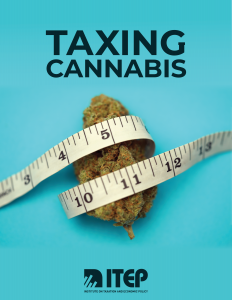 While price-based cannabis taxes may be useful in helping ensure that high-potency cannabis and premium cannabis are subject to somewhat higher taxes, any price-based tax should be accompanied by a weight-based tax to improve the long-run sustainability of cannabis tax revenues. Some experts have proposed that a cannabis excise tax would work most effectively if it was applied to the amount of THC being sold rather than simply the plant’s weight or price. Technology exists to test for the amount of THC in a plant and many states require disclosure of THC content, but reliability and replicability of testing remain problematic, especially for raw plant material. Indeed, cannabis testing laboratories lack the regulation and oversight that most other public health and safety labs require. Thus, there is not yet an industry standard and testing results may vary. If a tax is levied on a seller’s reported THC content, then sellers would be incentivized to give accurate content levels because underreporting THC content to avoid a higher tax would risk losing customers. A tax on reported THC content of raw plant matter could be combined with a tax on tested THC content of concentrates. Testing results for concentrates are much more reliable than those for raw plant material. Given current technological limitations, the tax code’s approach to THC may have to more closely resemble its treatment of nicotine than of alcohol; although alcohol is frequently an important determinant of a product’s tax rate, no jurisdiction in the world taxes tobacco by nicotine content. Taxes on THC content remain an interesting possibility, but a weight-based tax remains a more practical alternative for now. Among the biggest hurdles faced by regulators in establishing legal cannabis markets is competition from the illicit market. At the outset, cannabis prices in the legal markets have typically been much higher than black market prices. This creates an incentive for consumers to avoid shifting their purchases to the legal market, particularly since most cannabis consumers are accustomed to shopping in the black market as it was previously the only option available. In the short-run, states should help put their newly legal markets on a somewhat more competitive footing with the illicit market by levying a low tax rate on cannabis. On its own, a low tax rate is unlikely to equalize prices across the legal and illicit markets during the early days of legalization when newly legal businesses are grappling with supply constraints. But a low tax rate at the outset can help to ensure that states are not driving a larger wedge between prices on the legal versus illicit markets. Low tax rates should not be made permanent, however. While high retail prices pose a problem for law enforcement in the early stages of legal sales, very low prices are likely to be the more important issue once legal markets are fully established. For this reason, states should schedule a gradual phase-in of their ideal long-run cannabis tax rate. The experience of states such as Colorado has shown that cannabis prices can fall dramatically as producers and retailers learn to operate more efficiently. Moreover, a potential easing of federal restrictions on access to banking, certain tax deductions, and the interstate shipment of cannabis could lead to similarly dramatic price declines in the years ahead. A very low price for cannabis could have troubling implications, such as making the drug affordable even to adolescents with minimal disposable income. And when pre-tax prices plummet, the argument that low tax rates are required to make the legal market competitive with the illicit market will become substantially weaker. After a few years of shopping in legal, regulated stores, it is unlikely that a significant number of consumers will abandon the convenience, selection, quality-control, and protection from legal repercussions offered by legal stores. (Consider, for example, the small number of moonshiners operating now compared to just after the end of alcohol prohibition.) A gradual phase-in of cannabis taxes is the best way to draw consumers into the legal market without sacrificing long-run revenue collections with a permanently low rate of tax. Put another way, state lawmakers should not allow what is largely a short-run concern (the illicit market) to dictate tax policy for the long-haul. While no state has thus far chosen to phase-in their cannabis taxes, this approach was used at the federal level at the end of alcohol prohibition in the 1930s and it would be simple to implement in the context of cannabis taxation as well. Forty-five states levy general sales taxes which, in principle, should apply broadly to most or all retail transactions. Most of those states also allow their local governments to levy general sales taxes. Until recently, however, the illegal and unregulated nature of cannabis resulted in it being sold entirely outside of state sales tax structures. In other words, cannabis has enjoyed a de facto sales tax exemption. Bringing cannabis out of the black market allows state and local governments to include the product in their sales tax bases in the same manner as most other goods and services. State and local general sales taxes should be collected on final sales of cannabis just as they are already collected on other retail transactions, with the possible exception of medical cannabis, discussed below. Determining the proper tax treatment of cannabis is complicated by the fact that the drug can be used for both recreational and medicinal purposes. Recreational cannabis can create some of the same societal costs as alcohol, such as impaired driving. Medical cannabis use, by contrast, should arguably enhance the wellbeing of society overall when used correctly. Excise taxes on cannabis are generally thought of as a tool for discouraging the drug’s use or funding programs that can offset its negative societal effects—issues that are less applicable in the case of medical cannabis. From that perspective, there is little rationale for applying a stand-alone excise tax to medical cannabis. General sales taxes are a separate issue. Nearly every state in the country exempts prescription drugs from its general sales tax, but very few states exempt non-prescription drugs. At present, medical cannabis is best classified as a non-prescription drug since its lack of approval by the Food and Drug Administration (FDA) means doctors can only recommend that their patients use cannabis rather than formally prescribe it. This suggests that, barring FDA approval, state and local sales taxes should apply to medical cannabis. And indeed, most states have decided to include medical cannabis sales in their general sales tax bases, although at least eleven states offer an exemption for such sales. Thus far, every state that has legalized recreational cannabis for use by adults first established a medical market. State policymakers considering legalization may be concerned that levying lower taxes on medical cannabis may lead to tax base erosion in the recreational cannabis market. That is, a lower tax on medical cannabis may incentivize consumers to seek doctors’ recommendations without a bona fide medical condition to purchase cannabis at a discount. But it is unclear whether this is happening in practice, and a robust regulatory system around medical cannabis could help prevent this outcome. Colorado, for example, has permitted medical-use cannabis since 2000 and medical sales grew every year until 2016. After recreational cannabis had been available for two years, however, medical sales saw their first ever decline while recreational sales continued to grow. For cannabis users with legitimate medical needs, the introduction of a recreational cannabis option is somewhat akin to a previously prescription-only drug suddenly becoming available over-the-counter. Even if a patient can still obtain a prescription for their medication, the inconvenience and cost of a doctor’s appointment may encourage patients to purchase the over-the-counter option even if it is somewhat more expensive. Substantial excise taxes on medical cannabis run the risk of preventing lower- and moderate-income patients from accessing a necessary treatment. Ideally, cannabis purchased for legitimate medical use, with a doctor’s recommendation, should be taxed in the same manner as any other non-prescription medication. But states seeking to levy significantly lower tax rates on medical cannabis than on recreational cannabis should be sure to have a robust regulatory system in place to ensure that cannabis qualifying for the reduced medical rate is only available to patients with a legitimate medical need. States with legal cannabis sales have adopted a variety of cannabis tax regimes built around the product’s weight, its price, or both. Appendix A describes state approaches to both excise taxation and general sales taxation of adult-use recreational cannabis, and the discussion below outlines some of those approaches. Alaska and California currently employ weight-based taxes on cannabis. Maine is also scheduled to implement such a tax, though retail sales have yet to begin. In Maine, voters initially approved a purely price-based tax, but legislators modified that system to include taxes on both the price and weight of cannabis to improve the long-run sustainability and enforceability of the tax. Among these three states, tax rates on cannabis flowers, or bud, are $50 per ounce in Alaska, $20.94 per ounce in Maine, and $9.25 per ounce in California. Unlike California and Maine, Alaska lacks a statewide price-based tax on cannabis sales, which helps explain why Alaska levies a higher rate. Alaska also offers a lower rate of $25 per ounce on immature or abnormal flowers. Each of these three states also levies lower taxes on cannabis leaves, or trim, than it does in the plant’s more potent flowers. Per-ounce tax rates on trim are $15 in Alaska, $5.88 in Maine, and $2.75 in California. Each of these states also levies a tax on immature cannabis plants, and Maine levies a tax of 30 cents per seed. California is the only state that has taken the sensible step of indexing its weight-based tax rates to inflation. This means that in Alaska and Maine, the real value of these weight-based taxes will inevitably decline over time as inflation erodes the real value of the flat tax amounts written into law. While not levying traditional weight-based taxes, Colorado and Nevada are also notable in that their tax systems require that weight be factored into the tax calculation. Specifically, both states levy 15 percent taxes on producers based not on the actual prices they charge, but on the average fair market price of various categories of cannabis products. In Colorado, for instance, a vertically integrated producer would calculate the amount of tax it owes on its cannabis flowers by weighing them, multiplying that weight by an average market price of $781 per pound (as of January 1, 2019), and then multiplying that figure by 15 percent. The calculation proceeds in a similar fashion in Nevada for all producers, vertically integrated or not. Except for Alaska, every state allowing taxable sales of recreational cannabis levies a price-based excise tax on those sales. California, Colorado, Massachusetts, Nevada, Oregon and Washington collect cannabis-specific taxes based on the product’s price, and Maine and Michigan are scheduled to do so once legal businesses in those states open their doors to the public. As described above, Colorado and Nevada each levy a 15 percent tax on the average market price for wholesale sales. California, Colorado, Maine, Massachusetts, Michigan, Nevada, Oregon and Washington each levy cannabis-specific taxes on the consumer’s sale price ranging from 10 to 37 percent. Alaska, Massachusetts, and Oregon give localities the option to levy an additional cannabis-specific tax (in Massachusetts and Oregon, local tax rates are capped at 3 percent). California also gives localities the option to levy a local cannabis business tax. Rates currently range as high as 20 percent on the business’s gross receipts and up to $25 per square foot of cultivation space. In Washington, cannabis businesses are also responsible for the state’s 0.484 percent business and occupation tax (B&O tax) on gross receipts. Colorado, Oregon, and Washington have already adjusted their price-based tax rates since their original enactment. Colorado was the first state to open retail stores—doing so in January 2014—and it initially levied a 15 percent excise tax on producers and a 10 percent excise tax on consumers, in addition to the regular state sales tax of 2.9 percent and any local sales tax. The state has since kept the 15 percent excise tax on producers but shifted to a 15 percent excise tax on consumers while exempting cannabis sales from the state sales tax. The Oregon legislature shifted from a per ounce excise tax levied on the wholesaler (Oregon does not have a statewide sales tax) to a 17 percent excise tax on consumers and a local tax of up to 3 percent for cannabis. Washington shifted from a 25 percent excise tax levied at the producer, processor and consumer levels to a single 37 percent excise tax on only the consumer. These early adjustments indicate that state lawmakers are interested in adjusting and improving upon their cannabis tax structures as they become more familiar with this new industry. With the spread of legal cannabis sales for adult recreational use, cannabis’s de facto sales tax exemption is eroding. Of the nine states that have legalized recreational cannabis sales, six include the product in their statewide general sales tax bases. Colorado exempts recreational cannabis, though not medical cannabis, from its state sales tax. Alaska and Oregon do not levy statewide general sales taxes. 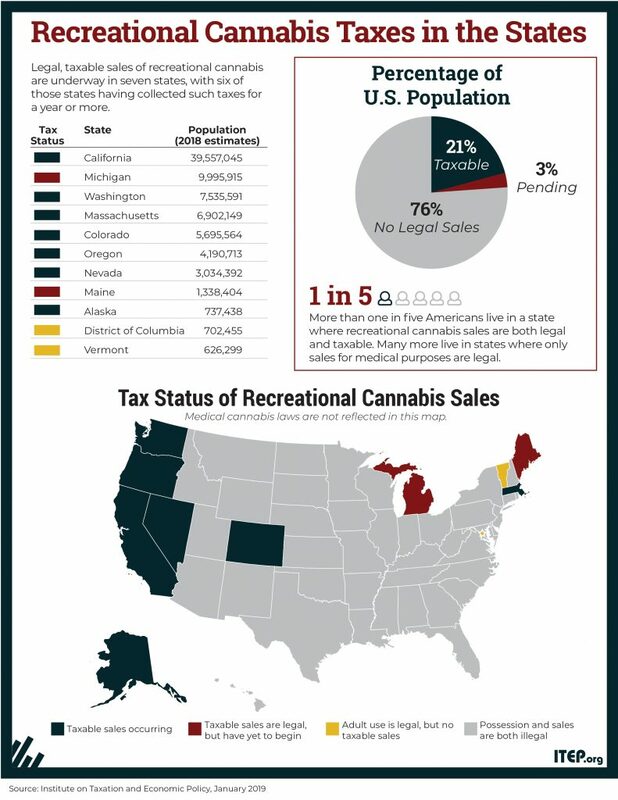 Five of these nine states allow their local governments to levy general sales taxes (Alaska, California, Colorado, Nevada, and Washington), and in all five states those local governments are allowed to include cannabis sales within the scope of their general sales taxes. Notably, Massachusetts and Oregon lack local-level general sales taxes but allow their local governments to levy cannabis-specific taxes at rates of up to 3 percent. In Alaska, localities have the option to include cannabis in their local general sales tax bases (with rates currently ranging as high as 7.5 percent), levy a stand-alone excise tax on cannabis, or levy both taxes simultaneously. States have taken varied approaches to taxing medical cannabis. 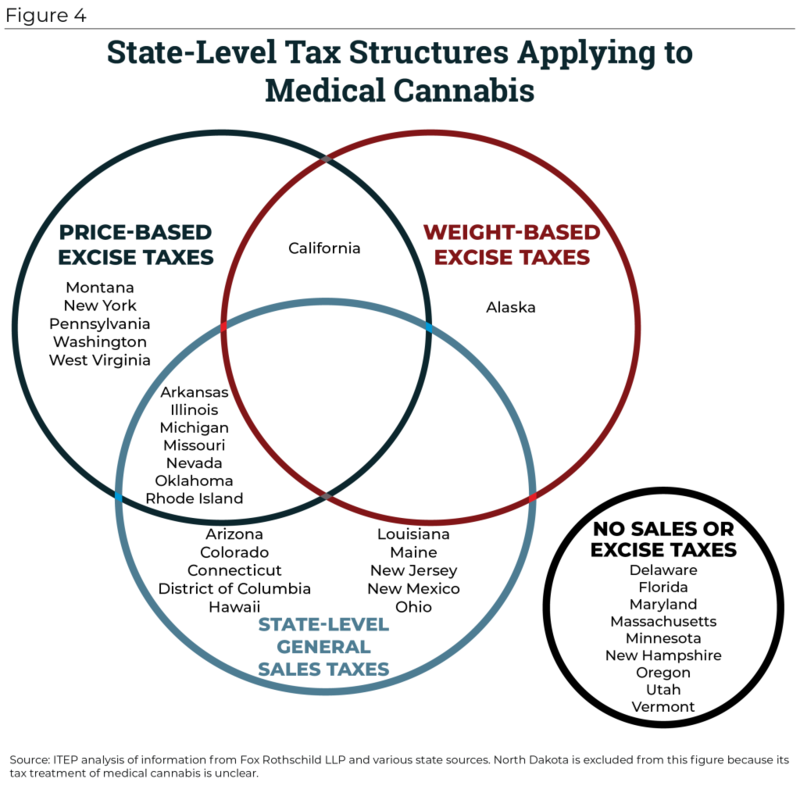 While some states tax medical cannabis similarly to non-prescription medication (applying general sales taxes but not additional excise taxes), others levy excise taxes to replace, or complement, general sales taxes. A detailed summary of state tax regimes as they apply to medical cannabis is available from Fox Rothschild LLP. At least sixteen states and the District of Columbia levy general sales taxes on the sale of medical cannabis, while fourteen states collect some type of excise tax. At least seven states collect both general sales taxes and excise taxes on sales of medical cannabis. Seven states collect excise taxes but not general sales taxes. And nine states apply neither excise taxes nor general sales taxes to medical cannabis sales. In states with both recreational and medical sales, medical cannabis is often exempt from some consumption taxes. Colorado, Maine, Massachusetts, and Oregon, for example, exempt medical sales from their cannabis excise taxes, although Colorado and Maine do apply their general sales taxes to medical cannabis. In California and Washington, medical cannabis is subject to excise taxes, but the general sales tax does not apply. Until recently, estimates of the potential revenue yield of taxes on recreational cannabis were based on surveys in which respondents often tended to underreport their use of this illegal drug, and on speculation into how a new legal market might operate. Growing experience with actual legal markets for cannabis, however, is providing a rich new source of data. As a result, there are now more than half a dozen states gaining real world experience with a tax that did not exist a decade ago. As seen in Figure 5, states with taxable retail sales of recreational cannabis in 2014 (i.e. Colorado and Washington) raised a mere $54.6 million in cannabis excise taxes that year. That figure more than quadrupled in 2015, to $218.5 million, as those two states’ retail markets grew. Rapid growth has persisted in every subsequent year as the early-adopting states continued to see more growth and as additional states began taxing recreational cannabis. 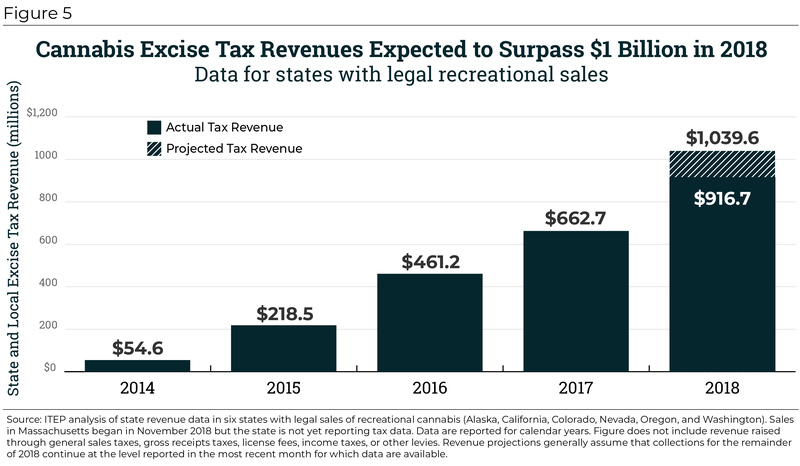 Combined state and local cannabis excise tax revenues in the six states with available data are expected to surpass $1 billion annually for the first time in 2018 (as of this writing, fourth quarter data for 2018 are still incomplete). Most states allowing for the legal sale of recreational cannabis also apply state and/or local sales taxes to the drug’s purchase price. Those taxes, which are not included in Figure 5, are expected to raise more than $300 million in additional revenue in 2018. Gross receipts taxes, license fees, and income tax revenues associated with recreational cannabis are also excluded from Figure 5. Excise taxes on alcohol, tobacco, and cannabis are sometimes referred to as “sin taxes” because the use of these products is considered to produce negative social outcomes and these targeted taxes can both discourage these products’ use and raise revenue to offset those costs. Figures 6 and 7 compare state and local cannabis excise tax revenue collections to the revenue raised from state and local excise taxes on alcohol and tobacco. In the six states where legal recreational sales have been underway for a year or more, the total amount of revenue raised from cannabis excise taxes ($1.04 billion) is roughly on par with the amount raised through excise taxes on alcohol ($1.16 billion). Most state and local alcohol tax revenue comes from the sale of liquor, or spirits. 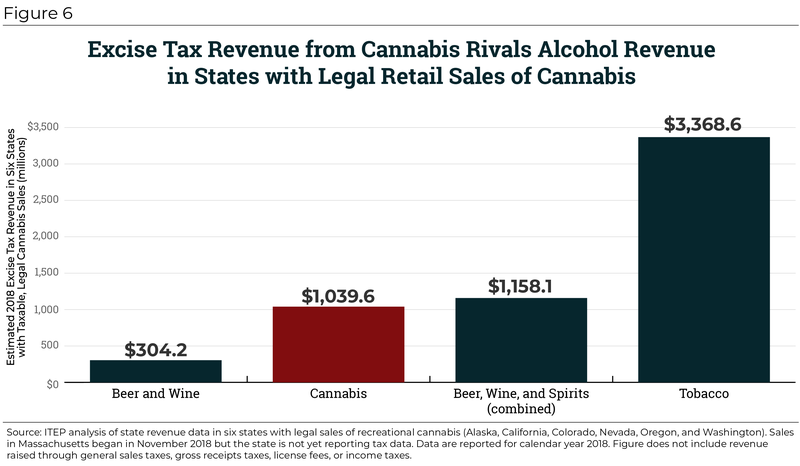 If those sales are excluded and the analysis is narrowed to include only taxes on beer and wine, then Figure 6 shows that total excise tax revenue from cannabis sales across these six states ($1.04 billion) is more than three times larger than total excise tax collections from beer and wine sales ($304 million). This is partly a reflection of a substantial and growing market for legal cannabis, and partly of the fact that beer and wine taxes tend to be quite low, sometimes just pennies per gallon. Figure 6 also shows that cannabis excise taxes currently raise far less revenue than excise taxes collected on the sale of tobacco products, which totaled nearly $3.37 billion across the six states examined here. A closer look at state-by-state revenue from these so-called “sin taxes” on alcohol, tobacco, and cannabis is provided in Figure 7. Remarkably, all six states collect more revenue from their excise taxes on cannabis than from their excise taxes on beer and wine. Two states, Colorado and Nevada, collect more from their cannabis excise taxes than from their excise taxes on all alcohol, including liquor, wine, and beer. And in Washington State, cannabis excise taxes are nearly on par with excise tax revenue from all forms of alcohol. Only one state, Colorado, collects more revenue from cannabis excise taxes than from tobacco excise taxes. In Colorado, cannabis excise taxes in calendar year 2018 (projected at $243.5 million) are expected to rival total excise tax revenue collections from beer, wine, spirits, and tobacco combined (projected at $253.1 million). Some of these cannabis markets are quite new. For example, California and Nevada’s markets have each been in operation for less than two years and it is therefore reasonable to expect that in these states, cannabis tax revenue growth could outpace growth in alcohol or tobacco tax revenues in the years ahead. Once California’s recreational cannabis market matures, for instance, it is very likely that cannabis excise tax revenues will exceed excise tax revenues from the sale of alcohol. Official projections from the governor’s office currently indicate that this will occur in fiscal year 2020. Of course, excise taxes are not the only taxes levied on alcohol, tobacco, and cannabis. States and localities often tax these products under their general sales taxes as well–the same taxes that consumers pay on the clothing, furniture, toiletries, and other items they buy every day. Because consumers spend far more on alcohol and tobacco than on cannabis, the general sales tax revenue associated with those first two categories of products is surely larger than the general sales tax revenue raised from legal cannabis. But states do not typically report the amount of general sales tax revenue they raise from alcohol or tobacco (or from most other specific categories of good and services) which makes an accurate comparison of sales taxes across product types impossible. Nonetheless, a focus on excise taxes, or “sin taxes,” provides an informative lens because these taxes, in theory, should be specifically calibrated to deter consumption and to offset the negative consequences of these products on society. A combined revenue gain in excess of $1 billion annually is a meaningful amount for these six states, though not a transformative one. State and local governments in these jurisdictions raised a combined total of nearly $335 billion in tax revenue in fiscal year 2016. Across all six states, the amount of revenue raised from cannabis excise taxes falls short of one percent of total state and local tax collections. Since the bulk of cannabis tax revenue collections flow to states rather than localities, however, the impact on state budgets specifically is somewhat more meaningful. States’ experiences with the taxation of recreational cannabis thus far have made clear that new tax revenues will not materialize overnight. Most states legalizing the substance saw more than a year lapse between legalization and the date of the first legal sale. And even after sales are underway, revenue performance is often underwhelming in the initial months, and sometimes years, as businesses inevitably need time to ramp up their operations. 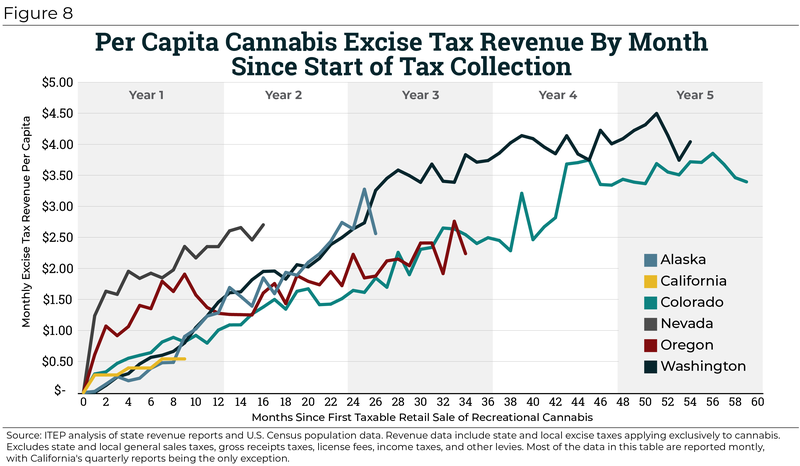 Figure 8 shows the month-by-month trajectory of cannabis excise tax revenues in all six states where taxable sales of recreational cannabis have been underway for a year or more. These figures are reported on a per capita basis—that is, adjusted for the size of each state’s population—in order to facilitate comparisons across states. Every state has exhibited rapid revenue growth throughout the first year of legal sales and, for the most part, substantial revenue growth in the second year as well. Oregon’s cannabis excise tax revenues over the most recent 12-month period were a full 40 percent higher than during the preceding 12-month period. In Colorado, the comparable figure stands at 20 percent while in Washington State year-over-year growth totaled 9 percent. Alaska, which is earlier in the process of establishing its legal market, experienced rapid growth of 173 percent relative to a year earlier. California, Massachusetts, and Nevada each have less than two years of experience with recreational cannabis taxation but are poised to see rapid revenue growth in the months and years ahead as their legal markets expand. 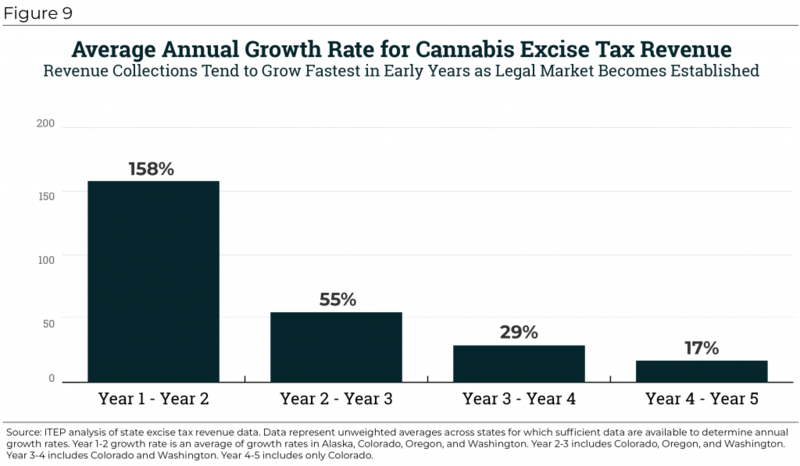 Figure 9 summarizes the average rate of growth that states legalizing and taxing recreational cannabis have seen in each of the years immediately following the start of taxable sales. While every state’s experience with legalization will be somewhat different, these data offer some rough guidelines regarding the growth rate that states implementing cannabis excise taxes might expect in the early years. There are four states in which taxable retail sales of cannabis have been underway for two years or more: Alaska, Colorado, Oregon, and Washington. Among those four states, three saw excise tax revenues double between the first and second full years of collections. The average annual rate of growth across these states was 158 percent. Revenue growth has also been very strong between years two and three, with an average rate of growth across Colorado, Oregon, and Washington of 55 percent. Between years three and four the comparable figure is 29 percent. And then in Colorado, the only state reporting nearly five years of revenue data, excise tax growth between years four and five appears to be on pace for roughly 17 percent growth. These findings suggest that it will take several years after legalization for a state to realize the full revenue potential of cannabis taxation. And even then, as described elsewhere in this report, new developments such as cannabis price cuts may stand in the way of revenue stability. While there appears to be some leveling-off of revenue growth in states where cannabis taxation has been underway for several years, there are no guarantees that future cannabis tax revenues—particularly those raised by price-based taxes—will plateau for long. Cannabis legalization should not be pursued solely for reasons of tax policy. Nevertheless, lawmakers in states considering legalization are often, quite sensibly, interested in knowing what legalization and taxation could mean for state and local revenue collections. Data limitations and the uncertainty associated with establishing new legal markets for cannabis mean that any estimate of the amount of revenue that cannabis taxes could raise will be imprecise. But state and local revenue collections over the last five years arguably allow for better revenue estimation today than ever before. Appendix B reports 50-state estimates of recreational cannabis taxation based on Washington State’s experience, wherein state and local governments are collecting approximately $460 million annually through a 37 percent excise tax, a 6.5 percent state sales tax, and local sales taxes averaging 2.82 percent statewide. Despite these relatively high tax rates, Washington’s cannabis users are paying no more for the substance than they did prior to legalization and they are enjoying the benefits of improved selection and quality control offered by legal stores. In Washington, $460 million is equivalent to $493 per regular cannabis user, defined in this report as adults who used cannabis within the last month. Frequent users account for most cannabis sales and are therefore a useful guidepost for scaling Washington’s revenue amount up, or down, to match the profile of other states. The calculations contained in Appendix B suggest that legalizing recreational cannabis in every state and applying levels of taxation in line with those that currently exist in Washington State could generate $11.9 billion in state and local revenue each year. While this is a substantial sum, it is not a transformative one. Total state and local tax collections totaled nearly $1.6 trillion in fiscal year 2016, meaning that the amount of cannabis tax revenue projected in this report would amount to less than 1 percent of state and local tax revenues collected nationwide. By comparison, states and localities raised approximately $7.3 billion from their excise taxes on alcohol and $18.4 billion from their excise taxes on tobacco products in fiscal year 2016, the most recent year for which data are available. They also raised additional revenue from the application of general sales taxes to these products, though these data are not reported separately. Thus far, most states pursuing legalization have been reluctant to impose taxes on cannabis at levels as high as in Washington. Recent evidence suggests, however, that even Washington’s comparatively high levels of tax are falling short of the revenue-maximizing level. It is also vital to note that matching Washington State’s current level of taxation is not simply a matter of copying the state’s tax structure. Because Washington’s system for taxing cannabis is structured largely around the price of the product, the state is vulnerable to future revenue declines if prices continue to fall (as discussed in the next section). While Washington has demonstrated that collecting an annual average amount of $493 per regular user is feasible, sustaining this level of collection over the long-run will likely require levying a weight-based tax rather than one tied to the uncertain, and declining, price of cannabis. The past five years of experience with legal recreational cannabis have provided new and important insights into the tax revenue potential of cannabis. But prior experience does not always offer a reliable guide to what lies ahead. This section discusses five issues that will be key in determining the amount of tax revenue that states will be able to raise from legalized cannabis: future cannabis prices, changes in consumption, the status of the illicit market, the impact of cannabis tourism, and the federal government’s approach to cannabis. Most states with legal recreational cannabis levy their taxes as a percentage of the product’s price at either the wholesale or retail level. This means that the price of cannabis is usually a major driver of the amount of revenue that can be gained through taxation. Thus far, the experience of every state where legal, taxable sales have been underway for three years or more—Colorado, Oregon, and Washington—indicates that prices are likely to fall substantially in the years following legalization as competition increases and cannabis businesses learn to operate more efficiently. 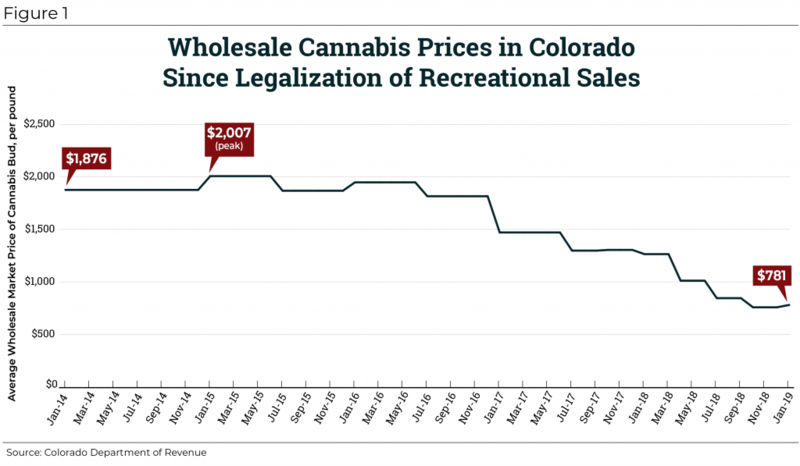 Figure 1 showed that the average price of wholesale cannabis in Colorado has already plummeted from a peak of $2,007 per pound in 2015 down to just $781 per pound today. While it is impossible to know for sure what will happen to cannabis prices in the years ahead, it is worth pointing out that very few crops command anything close to this price even at the retail level, which suggests that there may still be significant room for further price reductions. Indeed, a study by the RAND Corporation describes a price of $227 per pound (or 50 cents per gram) as a “conservative” estimate of long-run retail prices and theorizes that the price could fall to as low as one-tenth that amount. As discussed later, various forms of federal policy change could accelerate the ongoing trend toward lower cannabis prices in the years ahead. It is becoming increasingly clear that cannabis prices will fall significantly within a legal market, and when this occurs revenues collected from any sales or excise tax tied to the price of cannabis will be dramatically reduced. Under any type of cannabis tax, the amount of cannabis purchased will be a key determinant of tax revenue yield. But the future of cannabis consumption remains uncertain. There is some evidence that states legalizing recreational cannabis have seen a modest uptick in use following legalization, though it can be difficult to establish a baseline for such comparisons as many people are reluctant to admit to using cannabis before legalization. Moreover, short-term changes in consumption are not always indicative of a long-run trend because consumer preferences inevitably evolve over time. While it seems likely that legalization will cause some individuals who had previously abstained to consume cannabis, it is impossible to know how much of an initial increase in usage will become permanent and how much is a product of the novelty of legal sales that will fade with time. Analysts at the Cato Institute have plausibly theorized that new consumers under legalization are most likely to be “casual users” whose spending on cannabis will remain modest. Much like with alcohol, heavy users are responsible for the bulk of cannabis spending. According to one estimate, just one-third of cannabis users (those using daily or nearly daily) undertake three-quarters of cannabis spending. Similarly, a more recent estimate from Colorado indicates that in 2017, just 22.1 percent of users accounted for 71.1 percent of consumption. Moreover, it is important to keep in mind that there are limits to the amount that households will spend on leisure activities overall, including cannabis use or other activities such as going to a movie theater or out to dinner. Moving cannabis sales out of the illicit market and into a legal, taxed market will generate an unambiguous revenue gain for states. But the apparent revenue gain from converting non-users into users may be partly undercut if new users ultimately spend less money on other forms of taxable leisure. Over the long-run, it’s unlikely that consumers’ interest in cannabis will move in a straight line, as the nation’s experience with alcohol consumption makes clear. Since the 1950s the share of Americans saying they consume alcohol at least occasionally has been as low as 58 percent and as high as 71 percent. How Do Other Excise Taxes Fare in the Wake of Cannabis Legalization? Another question surrounding the revenue impact of cannabis legalization is the extent to which it impacts revenue raised from excise taxes on alcohol and tobacco. The evidence as to whether cannabis is a substitute or complement for alcohol is still mixed. Most of the research that has been done has focused on the impact of medical cannabis laws on alcohol consumption, and thus may not be generalizable to the impact of retail cannabis sales on alcohol sales. Current research is also limited in its generalizability because the studies measure different age groups, measures of alcohol consumption, and periods of time. Further, different demographic groups (e.g. adults and teens, high-income users, and low-income users) may differ in their substitute-complement relationship for alcohol and cannabis. * In the states with the longest running retail sales, Colorado and Washington, there does not appear to have been a meaningful negative impact on their alcohol tax revenue. Current research links increased cannabis use to increased tobacco use. This means that legalization of cannabis could increase revenue raised by tobacco excise taxes. However, this research is generally based in the current legal landscape of cannabis prohibition, so legal cannabis may not have the same impact on tobacco use. Since legal retail sales started in 2014 there has not been a dramatic increase in tobacco tax revenue in the states with legal cannabis. * Beau Kilmer and Rosanna Smart. “How Will Cannabis Legalization Affect Alcohol Consumption?” Rand Corporation, February 13, 2018. https://www.rand.org/blog/2018/02/how-will-cannabis-legalization-affect-alcohol-consumption.html. At the outset, one of the most important determinants of cannabis tax revenue performance will be the ability of legal businesses to draw customers away from the illicit market. Established cannabis users are accustomed to buying the product on the illicit market, and while some consumers are willing to pay more for the convenience, selection, and quality-control benefits offered by legal businesses, there is a limit to how much more they are willing to pay. With any tax, some level of evasion is inevitable. No state with a legal retail market will completely eliminate competition from the illicit market. In any case, state lawmakers should be careful to create a robust enforcement regime that limits opportunities for tax evasion, such as applying cannabis taxes relatively early in the production process in order to minimize diversion of cannabis out of legal channels before the tax is applied. To make legal businesses competitive with the illicit market, lawmakers should phase in the implementation of cannabis taxes. Evidence from Colorado and elsewhere indicates that cannabis prices in the legal market are likely to be highest in the months and years immediately following legalization, which suggests that this is the time when legal businesses will be most in need of a competitive boost. In the long-run, it is unlikely that consumers who have become accustomed to the convenience and selection of legal stores will suddenly retreat to the illicit market because of a difference in prices, particularly as legal stores are able to improve their efficiency and bring down their pre-tax costs. Once prices begin to fall and consumers have become accustomed to shopping in the legal stores, states should have considerably more flexibility to increase their cannabis tax rates without risking a mass exodus to the illicit market. Also of note is homegrown cannabis, which cannot be reliably taxed and can therefore impact cannabis revenue collections. Regulations for homegrown cannabis pre-date retail sales by at least a decade. States with legal retail markets must ensure that the regulations for homegrown cannabis keep up with the realities of the new retail market. Prior to legal retail sales, homegrown plants were generally permitted for medical patients and their caretakers or medical providers, and often homegrown plants were the only medical cannabis available. Lawmakers were hesitant to apply strict limits on the number of plants and often deferred to medical providers guidance on how many plants were medically necessary. The intention was to avoid impeding patients’ access to what was often the only legal source of medical cannabis. In the absence of state regulations to the contrary, the de facto limit home growers placed on themselves was 100 plants to avoid federal mandatory sentencing. For example, in Colorado home growers could cultivate up to 99 plants per patient until the law changed in 2018. According to a former director of Colorado’s cannabis enforcement agency, most home growers abided by state regulations, but some unscrupulous growers took advantage of the lax policy for personal profit. States with legal retail markets have begun implementing regulations to curb excessive home growth. Alaska, California, Colorado, Massachusetts, Nevada, Vermont, and the District of Columbia each allow individuals to grow up to six plants per person for non-medical purposes. Elsewhere the limits are three plants per person in Maine, four per person in Oregon, and twelve per household in Michigan. Washington is the only state with a legal recreational market that does not allow individuals to grow their own plants for non-medical purposes. Cannabis tourism is an emerging industry and entrepreneurs have developed tours for travelers seeking to use cannabis. Consumption by tourists is a potentially meaningful component of cannabis tax revenue collections, but considerable uncertainty exists regarding its current and potential impacts on revenues. The tax implications of cannabis tourism extend beyond just the impact on cannabis tax revenues. If people visit a state specifically because cannabis is legal, the result would be higher revenues from taxes on lodging, rental cars, gasoline, restaurant meals, and other items purchased by tourists. Policymakers and advocates of cannabis legalization sometimes argue that cannabis taxes will largely be paid by non-resident visitors who live in states where cannabis remains illegal. Nevada officials, for instance, predicted that 63 percent of sales would be made to out-of-state visitors, driven largely by the crowds of tourists who already flock to Las Vegas each year. A study of potential legalization of cannabis sales in Vermont, conducted prior to legalization in Maine and Massachusetts, also estimated that most sales would likely be to tourists. Seven times as many cannabis users live within fifty miles of Vermont as compared to the number of current users living inside the state’s borders. But there is also evidence that actual consumption by out-of-state visitors may be lower than some early predictions suggested. A 2017 study prepared for the Colorado Department of Revenue found that out-of-state sales have averaged about 8.6 percent of total consumption since sales began in 2014. This is considerably lower than the same group’s 2014 estimate that sales to out-of-state visitors accounted for about 44 percent of metro area and 90 percent of mountain community sales of retail cannabis. The 2014 report was published in July of that year, just six months after legal sales began. This suggests that much of the gain in state revenues due to tourism may be very short lived. Despite this early evidence that tourists were accounting for a large share of the state’s legal cannabis purchases in the early months, the group’s most recent estimates suggest that for the entirety of 2014, out-of-state visitors were responsible for just 7.4 percent of consumption. Ultimately, while the novelty of legal cannabis sales is likely to lure in some tourists, such an effect is unlikely to significantly impact a state’s overall level of tourism. A 2016 study from the state of Colorado showed that only four percent of adult visitors came to the state because of legal cannabis sales. Official state tourism departments are hesitant to advertise cannabis tourism because it still runs afoul of federal law. Further, all states ban public consumption of cannabis and consumption in hotel rooms is often, though not always, prohibited either by the state or by the hotels themselves. There are reports of private clubs operating in legal gray areas under social use licenses in Colorado and consumption lounges in a few California cities, but the law-abiding tourist will likely have difficulty finding a place to partake. Additionally, those who travel to a state are often unable to take cannabis home with them because the federal government still prohibits transporting cannabis across state lines. If federal prohibition stays in place and states do not allow places for legal consumption, then it is doubtful whether cannabis tourism will become a major revenue generator. Moreover, the tourism draw of legal cannabis is likely to wane as more states begin to allow retail sales. State experiences with legalized gambling provide a cautionary tale. As more states have legalized gambling, the tourist flow has slowed and the incidence of gambling taxes has shifted away from tourists and toward state residents. New Jersey is a prime example. The state was once the nation’s second largest gambling market behind Nevada, but after neighboring Pennsylvania opened casinos in 2006 New Jersey slipped behind it to third place. Competition from Pennsylvania had devastating impacts on Atlantic City’s economy. Between 2014 and 2016 five of the city’s twelve casinos closed, eliminating 11,000 jobs. Since then, gambling tax revenue has partly recovered and two new casinos opened in 2018. But it is unclear if more casinos will translate to more gaming tax revenue since the casinos are largely competing for the same pool of gamers. Gambling revenue is still far below its 2006 peak and the city has become more reliant on fees from parking and hotel rooms to keep its budget in balance. While it is unlikely that any state will become as dependent on its cannabis industry as Atlantic City is on its gambling industry, it is important that lawmakers recognize that tourist-driven cannabis tax dollars are likely to follow a similar pattern. Early adopters are likely to see the largest revenue gain from tourists, and that gain may not be easily replicable in late-adopting states. And as more states legalize cannabis even the early adopters are likely to see their tourism-related revenues wane. Actions by the federal government in the years ahead will have major implications for the amount of revenue that states and localities can generate from taxes on cannabis. The federal government has the legal authority to shut down state-sanctioned cannabis production facilities and retail outlets at any time. But as the number of such businesses has exploded, it has become increasingly impractical for the federal government to shut down state-sanctioned cannabis businesses in a broad way. Fears of aggressive federal intervention briefly surfaced upon the appointment of Jeff Sessions to the position of Attorney General. Sessions has said that he considers cannabis dangerous and something that “good people” do not use. In January 2018, he issued guidance reversing an Obama-era policy that had curtailed the federal government’s involvement in cannabis businesses operating in compliance with state law. Despite this official reversal, however, Sessions’ tenure as attorney general, which ended in November 2018, did not bring fundamental changes to the way the federal government has dealt with the cannabis industry in practice. Looking ahead, many of the actions that the federal government might take could help to grow the cannabis industry overall (thereby increasing cannabis tax revenues) while also contributing to a decline in cannabis prices (thereby reducing revenues in states that tax cannabis based on its price). The remainder of this section will consider three such policy changes: reforming the federal income tax treatment of cannabis industry expenses, allowing for the shipment of cannabis across state lines, and expanding access to banking services for the cannabis industry. State approaches to business tax deductions for the cannabis industry are varied, with some adhering to the federal government’s strict limitations on such deductions and others allowing a broader set of business deductions more in line with what businesses in other industries are afforded. In general, the cannabis industry would like to be able to claim the same types of ordinary business deductions available to other types of businesses. But a national consumer lobby, NORML, worries that allowing tax deductions for advertising expenses in particular would irritate parents and favor “well funded corporate controlled marijuana companies, which can afford extensive advertising.” Public health scholars worry that advertising and marketing of cannabis will stoke demand among youth and vulnerable users; while advertising may benefit from constitutional protection as commercial free speech, nothing precludes denial of tax deductions for advertising and marketing expenses. As a compromise, NORML has proposed allowing cannabis businesses to deduct expenses such as rent and wages, but to continue the denial of such deductions for advertising-related expenses. The fact that most business deductions are unavailable to the cannabis industry is pushing up costs for cannabis businesses which has the twofold effect of discouraging new businesses from entering the market and increasing the prices charged by businesses that are operating. If the federal government repeals or relaxes Section 280E as it applies to cannabis businesses, it is reasonable to expect that more cannabis businesses will open their doors, but that the price of cannabis will fall and states and localities whose tax structures are linked to that price will potentially face revenue declines. If the federal government were to enact a full-scale legalization of cannabis, one of the most significant changes would be the ability of cannabis businesses to ship their products across state lines. Currently, the interstate shipment of cannabis is a federal crime and therefore the states with legal cannabis are seeing the growing, processing, and selling of cannabis all happen entirely within their own borders. This is in sharp contrast to the markets for tobacco and alcohol, where shoppers are typically confronted with a range of choices that, for the most part, were shipped in from other states. Allowing for the interstate shipment of cannabis is likely to lead to consolidation in the cannabis industry, to the advantage of some states over others. States that are slow to allow for the establishment of a recreational cannabis industry within their borders may find that it is too late for their own residents to set up businesses that can compete with larger, more established companies that may seek to ship in their product from outside the state’s borders. Consolidation is also likely to lead to a dramatic drop in prices as large businesses realize economies of scale to bring down their costs. Such a drop will have a negative impact on state and local tax revenue collections in any jurisdiction that has tied its cannabis tax structure to the product’s price. Part of the leniency afforded to states with legalized cannabis sales by the Obama administration was guidance from the Treasury Department on how financial institutions could offer services to state-sanctioned cannabis-related businesses without facilitating money laundering. Attorney General Sessions’ announcement in January 2018 reversed this guidance. Large banks have been reluctant to publicly admit to offering services to cannabis businesses for fear of federal retaliation. But according to the latest report from the Treasury Department, as of September 2017, before Sessions’ announcement, 400 banks and credit unions were providing services to cannabis-related businesses—up from just over 300 in October 2016. This represents a tiny fraction of all the depository institutions operating at the same time—over 5,700 banks and 5,600 credit unions—meaning the vast majority of federally regulated banks have refused to accept money generated from cannabis sales. The result has been to force dispensaries to operate almost exclusively in cash, which can create significant problems for tax enforcement and make the dispensaries targets for robbery. States have limited ability to develop an effective workaround to the federal law. In Colorado, a few state credit unions handle most of the cannabis business. Stakeholders in Massachusetts have suggested solutions as varied as utilizing the blockchain technology popularized by cryptocurrencies like bitcoin or a state-run cannabis bank. Most states have a “seed to sale” tracking system in hopes of keeping track of the cash (and cannabis) flow, but it is unlikely this will completely resolve the issue. Federal intervention via the passage of legislation such as the proposed “Secure and Fair Enforcement (SAFE) Banking Act,” which would open up banking to the cannabis industry, could have a significant impact on the financial standing of the cannabis industry and tax enforcement in the states. As with most policy changes that would ease restrictions on the cannabis industry, however, such a change could also contribute to falling cannabis prices, with negative implications for states whose cannabis tax systems are based on price. Proponents of cannabis legalization often advocate for earmarking some portion of tax revenue to pay for specific public services. For example, the first $40 million generated each year by Colorado’s 15 percent tax on the average market price is earmarked for school construction, with an additional $30 million from the 15 percent tax on the sale price earmarked for the state’s public school fund in fiscal year 2017-2018 and a percentage of the special sales tax revenue earmarked in the years to follow. While earmarking cannabis funds for popular spending initiatives may make political sense, it is not necessarily effective budget policy. One inherent problem with earmarking is that state revenue is typically fungible between different spending areas. Lawmakers can shift other revenues away from the earmarked fund, leaving the overall amount of money spent on that area unchanged. In other words, earmarking can function more as a political talking point than a true policy commitment. Moreover, in the rare cases where earmarking may succeed in directing additional revenue toward particular causes, that outcome may not always be desirable. Substituting the best judgment of our elected officials with an automatic earmarking formula may prove problematic in the long run if state priorities change but the formula does not. Arbitrary constraints on how certain revenues must be spent can make it more difficult for lawmakers to craft budgets that direct public revenues to the areas where they are needed most. Additionally, earmarking excise tax revenue can be counterproductive if it creates a substantial incentive for lawmakers to promote the activity that the tax was initially intended to discourage. For example, some states effectively encourage residents to gamble to generate revenue through the state lottery. Because cannabis tax revenues are usually small relative to states’ total budgets, however, the temptation is modest in practice. While most cannabis tax earmarking proposals are made for political reasons, there is a case to be made for directing some revenues toward programs that offset negative externalities created by consumption. These could include, for instance, drug treatment and education programs. Most states generally direct funds first to cover administration and implementations costs of the program. Revenue can also be directed to enforcement and oversight of production, though much of this is already funded through licensing fees on producers and sellers. California and Massachusetts have opted to earmark funds for restorative justice and social service programs to assist the communities, predominantly low-income communities of color, that have been disproportionately impacted by policing due to prohibition. California and Washington both earmark funds for university-based studies on the impact of legalization on public health and safety, the economy, and criminal justice. Michigan voters agreed to earmark a portion of their upcoming cannabis tax revenues to clinical trials focused on the medical uses of cannabis by armed services veterans. Michigan and Oregon each earmark some of their state revenue collections directly to local governments. And earmarking cannabis tax revenue toward K-12 public education is also common. Alaska is the only state that does not currently earmark any of its cannabis revenue. There are a variety of goals lawmakers may seek to accomplish when taxing cannabis such as raising revenue, deterring consumption, and hastening the decline of the illicit market. The policy issues and choices outlined in this report will help inform how state and local tax laws can best achieve these goals in both the short- and long-term. While cannabis taxes are a meaningful source of revenue in states with established retail markets those revenues have not been high enough to fundamentally transform state budgets. In general, cannabis taxes tend to raise roughly the same amount as taxes on alcohol, and substantially less than taxes on tobacco. The evidence accumulated thus far points toward a few sensible recommendations for states considering legalization and taxation of recreational cannabis. Those include levying weight-based taxes that will be immune to the impending collapse in cannabis prices, indexing those weight-based tax rates to rise alongside inflation, phasing in cannabis taxes over time in order to hasten the decline of the illicit market, and earmarking cannabis tax revenues only sparingly if at all. This is a rapidly evolving policy area. States with legal markets and those considering establishing legal markets should pay close attention to the impacts of their policies, and those of their peers, to determine best practices and to prepare for inevitable changes in the cannabis industry. Institute on Taxation and Economic Policy. “The ITEP Guide to Fair State and Local Taxes,” March 3, 2011. https://itep.org/the-itep-guide-to-fair-state-and-local-taxes/. Institute on Taxation and Economic Policy. “How Sales and Excise Taxes Work,” August 2011, https://itep.org/how-sales-and-excise-taxes-work/. Alcohol and Tobacco Tax and Trade Bureau of the U.S. Department of Treasury. “Tax and Fee Rates,” accessed January 16, 2019. https://www.ttb.gov/tax_audit/taxrates.shtml. Campaign for Tobacco-Free Kids. “State Cigarette Excise Tax Rates & Rankings,” December 21, 2018, http://www.tobaccofreekids.org/research/factsheets/pdf/0097.pdf. Marijuana Policy Project. “Model Legislation to Regulate and Tax Marijuana Similarly to Alcohol,” accessed January 16, 2019. https://www.mpp.org/issues/legislation/model-state-bill-to-replace-prohibition-with-regulation/. Colorado Department of Revenue. “Current and Prior Average Market Rates for Retail Marijuana Excise Tax,” accessed January 16, 2019. https://www.colorado.gov/pacific/sites/default/files/AMR_PriorRates_Jan2019.pdf. Overton, Penelope. “Maine’s pot legalization committee reaches agreement on rewrite of voter-approved law,” Portland Press Herald, February 23, 2018. https://www.pressherald.com/2018/02/23/maines-pot-legalization-committee-finds-agreement-on-taxes-other-regulations/. Jonathan P. Caulkins Angela Hawken, Beau Kilmer and Mark A. R. Kleiman. Marijuana Legalization: What Everyone Needs to Know (New York City: Oxford University Press, 2012), 151-177. See research by Ben Hansen, Keaton Miller, and Caroline Weber posted by Pat Oglesby of the Center for New Revenue: https://newrevenue.org/2018/11/30/weak-correlation-between-thc-concentration-and-cannabis-price/. In addition, a “disadvantage to a tax based on THC potency is that it could encourage more consumption of less-potent marijuana… [i]f the public health costs of smoking marijuana outweigh the health costs of consuming more potent marijuana.” Jane G. Gravelle and Sean Lowry. Federal Proposals to Tax Marijuana: An Economic Analysis,” Congressional Research Service, November 13, 2014, https://fas.org/sgp/crs/misc/R43785.pdf. Institute on Taxation and Economic Policy. “Most Americans Live in States with Variable-Rate Gas Taxes,” June 28, 2017. https://itep.org/most-americans-live-in-states-with-variable-rate-gas-taxes-4/. Pat Oglesby. “Colorado’s Crazy Marijuana Wholesale Tax Base,” Center for New Revenue, March 26, 2014. http://papers.ssrn.com/sol3/papers.cfm?abstract_id=2351399. Governor’s Marijuana Advisory Commission. “Recommendations for Possible Taxing and Regulating of Adult-Use Marijuana in Vermont as Adopted by the Governor’s Advisory Commission on Marijuana,” December 2018. https://marijuanacommission.vermont.gov/document/taxation-and-regulation-subcommittee-final-report. Jonathan P. Caulkins, Angela Hawken, Beau Kilmer, Mark A. R. Kleiman, Katherine, Pfrommer, Jacob Pruess and Timothy Shaw. “High tax states: options for gleaning revenue from legal cannabis (A Step Forward: Creating a Just Drug Policy for the United States),” Oregon Law Review 91, no. 4 (n.d.): 1041–1068, accessed January 16, 2019. http://www.countthecosts.org/sites/default/Options-for-cannabis-revenue.pdf. Jonathan P. Caulkins, Beau Kilmer, Mark A. R. Kleiman, Robert J. MacCoun, Greg Midgette, Pat Oglesby, Rosalie Liccardo Pacula and Peter H. Reuter. “Considering Marijuana Legalization: Insights for Vermont and Other Jurisdictions,” Rand Corporation, 2015. https://www.rand.org/pubs/research_reports/RR864.html. Peter Unger, Roger Brauninger, Chris Hudalla, PhD, Mowgli Holmes, PhD and Bethany Sherman. “Standards for Cannabis Testing Laboratories,” Cannabis Safety Institute, December 2014. http://cannabissafetyinstitute.org/wp-content/uploads/2015/01/Standards-for-Cannabis-Testing-Laboratories.pdf. Pat Oglesby. “Tax Marijuana by Potency? Probably Not,” Center for New Revenue, March 20, 2013. https://newrevenue.org/2013/03/20/tax-marijuana-by-potency-probably-not/. Gene Johnson. “Legalizing Marijuana In Washington And Colorado Hasn’t Gotten Rid Of The Black Market,” Business Insider. http://www.businessinsider.com/legal-marijuana-in-washington-and-colorado-hasnt-gotten-rid-of-the-black-market-2015-1. Jonathan P. Caulkins, Beau Kilmer, Mark A. R. Kleiman, Robert J. MacCoun, Greg Midgette, Pat Oglesby, Rosalie Liccardo Pacula and Peter H. Reuter. “Considering Marijuana Legalization: Insights for Vermont and Other Jurisdictions,” Rand Corporation, 2015, 89. https://www.rand.org/pubs/research_reports/RR864.html. Some states have laws requiring illegal cannabis buyers or sellers to anonymously purchase and place tax stamps on their cannabis but virtually no one buys the stamps because possessing cannabis without medical authorization is illegal even with the stamps attached. Federation of Tax Administrators. “State Sales Tax Rates and Food and Drug Exemptions,” January 2018. https://www.taxadmin.org/assets/docs/Research/Rates/sales.pdf. Those states are California, Florida, Maryland, Massachusetts, Minnesota, New York, Pennsylvania, Vermont, Virginia, Washington, and West Virginia. It is unclear whether North Dakota’s general sales tax applies to medical cannabis sales. Jennifer E. Benda and Jacob D. Millis. “Cannabis Industry State Tax Guide,” Fox Rothschild LLP, September 2018. https://www.foxrothschild.com/content/uploads/2018/08/Cannabis-Tax-E-book-Septemberv2-2018-2.pdf. Elise Schmelzer. “Denver marijuana sales reach record high of $587 million, sales across state continue to rise,” Denver Post, August 19, 2018. https://www.denverpost.com/2018/08/09/colorado-marijuana-sales-2017-2/. Maine’s tax rates are officially set on a per-pound basis, but this section converts those rates to per-ounce amounts to allow for an easier comparison across states. Pat Oglesby.“Indexing: Rhode Island’s marijuana bill gets it,” Center for New Revenue, February 28, 2013. https://newrevenue.org/2013/02/28/indexing-rhode-islands-marijuana-bill-gets-it/. Pat Oglesby. “Colorado’s marijuana tax continues to decline,” Center for New Revenue, September 3, 2018. https://newrevenue.org/2018/09/03/colorados-marijuana-tax-continue-to-decline/. Pat Oglesby. “Nevada’s 70-cent per gram tax on marijuana flower,” Center for New Revenue, July 2, 2017. https://newrevenue.org/2017/07/02/nevadas-70-cent-per-gram-tax-on-marijuana-flower/. Jennifer E. Benda and Jacob D. Millis. “Cannabis Industry State Tax Guide,” Fox Rothschild LLP, September 2018. https://www.foxrothschild.com/content/uploads/2018/08/Cannabis-Tax-E-book-Septemberv2-2018-2.pdf. The California governor’s budget projects that in FY2020, alcoholic beverage taxes will raise $389 million and cannabis excise taxes will raise $514 million. Governor Gavin Newsom. “2019-20 Governor’s Budget: Revenue Estimates,” January 10, 2019. http://www.ebudget.ca.gov/budget/2019-20/#/BudgetSummary. U.S. Census Bureau. “2016 State & Local Government Finance Historical Datasets and Tables,” accessed October 10, 2018. https://www.census.gov/data/datasets/2016/econ/local/public-use-datasets.html. For the third year, Oregon only reported 10 months of data as of this writing. This calculation assumes that Oregon’s monthly revenue collections remain unchanged across months 10, 11, and 12. This calculation uses data from Colorado and Washington. For the fifth year, Colorado only reported 11 months of data as of this writing. This calculation assumes that Colorado’s monthly revenue collections remain unchanged across months 11 and 12. A crowdsourced Internet archive of cannabis prices, PriceOfWeed.com, reported an average price of $232 per ounce on the illicit market in July 2014, compared to $233 per ounce as of January 2019. Philip Ross. “Marijuana Costs In the US: How Black Market, Retail and Medical Pot Prices Compare,” International Business Times, July 8, 2014. https://www.ibtimes.com/marijuana-costs-us-how-black-market-retail-medical-pot-prices-compare-1622362. “Data for the price of weed in: Washington, United States,” PriceOfWeed.com, accessed January 16, 2019. http://www.priceofweed.com/prices/United-States/Washington.html. A more detailed explanation of the calculations undertaken in this report is provided in Appendix B.
 Brett Hollenbeck and Kosuke Uetake. “Taxation and Market Power in the Legal Marijuana Industry,” Available at SSRN, December 2, 2018. https://papers.ssrn.com/sol3/papers.cfm?abstract_id=3237729. Benjamin Hansen, Keaton Miller, and Carolina Weber. “The Taxation of Recreational Marijuana: Evidence from a Reform in Washington State,” August 2017. http://faculty.washington.edu/ceweber/HMW_marijuanatax.pdf. Josh Lehner. “Marijuana: Falling Prices and Retailer Saturation?,” Oregon Office of Economic Analysis, February 8, 2018. https://oregoneconomicanalysis.com/2018/02/08/marijuana-falling-prices-and-retailer-saturation/. William C. Kerr, Yu Ye, Meenakshi Sabina Subbaraman, Edwina Williams, Thomas K. Greenfield. “Changes in Marijuana Use Across the 2012 Washington State Recreational Legalization: Is Retrospective Assessment of Use Before Legalization More Accurate?,” Journal of Studies on Alcohol and Drugs, 79(3), 495-502 (2018). https://www.jsad.com/doi/abs/10.15288/jsad.2018.79.495. Jeffrey Miron and Katherine Waldock. “The Budgetary Impact of Ending Drug Prohibition,” Cato Institute, September 27, 2010. http://www.cato.org/publications/white-paper/budgetary-impact-ending-drug-prohibition. Christopher Ingraham. “Think you drink a lot? This chart will tell you,” Washington Post, September 25, 2014. https://www.washingtonpost.com/news/wonk/wp/2014/09/25/think-you-drink-a-lot-this-chart-will-tell-you/. Steven Davenport and Jonathan P. Caulkins. “Evolution of the United States marijuana market in the decade of liberalization before full legalization.” Journal of Drug Issues, 46(4):411–427 (2016). Adam Orens, Miles Light, Brian Lewandowski, Jacob Rowberry and Clinton Saloga. “Market Size and Demand for Marijuana in Colorado 2017 Market Update,” Marijuana Policy Group LLC, August 2018. https://www.colorado.gov/pacific/sites/default/files/MED%20Demand%20and%20Market%20%20Study%20%20082018.pdf. Gallup. “Alcohol and Drinking,” accessed January 16, 2019. https://news.gallup.com/poll/1582/alcohol-drinking.aspx. Michael Amlung, Derek D. Reed, Vanessa Morris, Elizabeth R. Aston, Jane Metrik, James MacKillop. “Price elasticity of illegal versus legal cannabis: a behavioral economic substitutability analysis,” Society for the Study of Addiction,114(1):112-118 (2019). Washington State Liquor and Cannabis Board. “FAQs on Marijuana,” accessed January 16, 2019. https://lcb.wa.gov/mj2015/faqs_i-502. Regina Garcia Cano and Scott Sonner. “Six things to know about Nevada marijuana: edibles, tourism impact, casino ban and more,” The Cannabist, July 3, 2017. https://www.thecannabist.co/2017/07/03/nevada-marijuana-tourism-edibles-casinos/82941/. Miles K. Light, Adam Orens, Brian Lewandowski and Todd Pickton. “Market Size and Demand for Marijuana in Colorado,” The Marijuana Policy Group, July 2014. https://www.colorado.gov/pacific/sites/default/files/Market%20Size%20and%20Demand%20Study%2C%20July%209%2C%202014%5B1%5D_3.pdf. Alicia Wallace. “Colorado’s tourism office will soon start educating visitors about marijuana laws,” The Cannabist, September 16, 2016. https://www.thecannabist.co/2016/09/16/marijuana-tourism-colorado/63350/. Leafly. “Public Cannabis Consumption Laws: A State-By-State Guide,” Updated October 30, 2017. https://www.leafly.com/news/cannabis-101/public-consumption-laws-a-state-by-state-guide. Matt Laslo. “American High: State-by-State Guide to Legal Pot,” Rolling Stone, April 19, 2017. https://www.rollingstone.com/culture/culture-news/american-high-state-by-state-guide-to-legal-pot-192704/. Marjorie Miller. “Los Angeles for tourists: Hollywood, beaches…and pot?” Associated Press, May 21, 2018. https://www.apnews.com/70321d47e1bc4e56a9c6d6e48103bce3/Los-Angeles-for-tourists:-Hollywood,-beaches-_-and-pot. Chris Kudalis. “Las Vegas: no marijuana lounges until 2019, monitoring Denver social use licenses,” The Cannabist, March 6, 2018. https://www.thecannabist.co/2018/03/06/las-vegas-no-marijuana-lounges-until-2019/100606/. Marjorie Miller. “Los Angeles for tourists: Hollywood, beaches…and pot?” Associated Press, May 21, 2018. https://www.apnews.com/70321d47e1bc4e56a9c6d6e48103bce3/Los-Angeles-for-tourists:-Hollywood,-beaches-_-and-pot. Misha Hill. “Lottery, Casino and Other Gambling Revenue: A Fiscal Game of Chance,” Institute on Taxation and Economic Policy, June 12, 2018. https://itep.org/lottery-casino-and-other-gambling-revenue-a-fiscal-game-of-chance/. Wayne Parry. “At 40, are Atlantic City casinos healing or courting danger?” Las Vegas Sun, May 11, 2018. https://lasvegassun.com/news/2018/may/11/at-40-are-atlantic-city-casinos-healing-or-courtin/. New Jersey Division of Gaming Enforcement. “Atlantic City Gaming Industry Casino Revenue Fund Taxes and Fees Source Report,” August 20, 2018. http://www.nj.gov/oag/ge/docs/Financials/CRFTF/CRFTFSourceReport.pdf. Christopher Ingraham. “Trump’s pick for attorney general: ‘Good people don’t smoke marijuana,” Washington Post, November 18, 2016. https://www.washingtonpost.com/news/wonk/wp/2016/11/18/trumps-pick-for-attorney-general-good-people-dont-smoke-marijuana/. Charlie Savage and Jack Healy. “Trump Administration Takes Step That Could Threaten Marijuana Legalization Movement,” New York Times, January 4, 2018. https://www.nytimes.com/2018/01/04/us/politics/marijuana-legalization-justice-department-prosecutions.html. NORML. “Federal: Legislation Pending To Cease Penalizing State-Compliant Marijuana Businesses Under the Federal Tax Code,” accessed January 16, 2019. https://norml.org/action-center/item/federal-legislation-pending-to-cease-penalizing-state-compliant-marijuana-businesses-under-the-federal-tax-code. Pat Oglesby. “How Bob Dole got America addicted to marijuana taxes,” December 18, 2015. https://www.brookings.edu/blog/fixgov/2015/12/18/how-bob-dole-got-america-addicted-to-marijuana-taxes/. U.S. Treasury Financial Crimes Enforcement Network. “BSA Expectations Regarding Marijuana-Related Businesses,” FIN-2014-G001, February 14, 2014. https://www.fincen.gov/resources/statutes-regulations/guidance/bsa-expectations-regarding-marijuana-related-businesses. U.S. Treasury Financial Crimes Enforcement Network. “Marijuana Banking Update,” Data ending September 30, 2017, accessed January 16, 2019. https://www.fincen.gov/sites/default/files/shared/273281%20EA%204th%20Q%20MJ%20Stats_Public_Web.pdf. Federal Deposit Insurance Corporation. “The FDIC and the Banking Industry: Perspective and Outlook,” accessed January 16, 2019. https://www.fdic.gov/about/strategic/strategic/bankingindustry.html. National Credit Union Administration. “Industry at a Glance,” Current as of September 30, 2017, https://www.ncua.gov/analysis/Pages/industry/industry-at-a-glance-september-2017.pdf. Shira Schoenberg. “Cash-heavy marijuana industry faces banking, security challenges,” MassLive.com, March 22, 2018. https://www.masslive.com/politics/index.ssf/2018/03/cash-heavy_marijuana_industry.html. Secure and Fair Enforcement Banking Act. S.1152 of the 115th Congress (2017-18). https://www.congress.gov/bill/115th-congress/senate-bill/1152. Shakala Alvaranga. “Why your child’s school may not see any of that marijuana tax money – Hint: it’s complicated,” LasVegasNow.com, September 5, 2018. https://www.lasvegasnow.com/news/why-your-childs-school-may-not-see-any-of-that-marijuana-tax-money-hint-its-complicated/1421997569. Marijuana Policy Project. “Medical Marijuana Dispensary Laws: Fees and Taxes,” accessed January 16, 2019. https://www.mpp.org/issues/medical-marijuana/medical-marijuana-dispensary-laws-fees-and-taxes/.